This is my calendar picture for December. 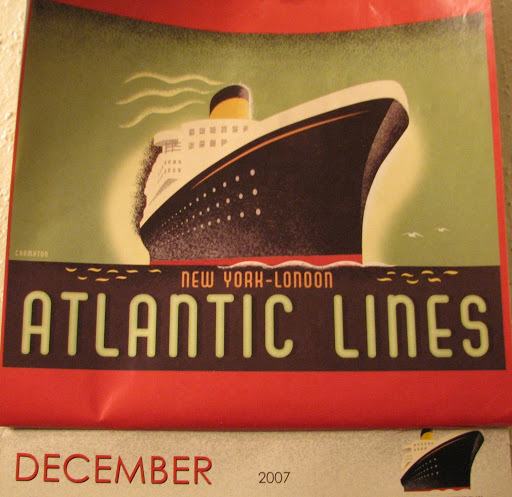 A year ago, when I received this calendar as a gift, little did I know that in December I would be entering my second week in a new job… at a company that services engines for ships like this. I know God knew it, though. I had long forgotten about December on this calendar (pictures about traveling). When I flipped the page late Friday night, I couldn’t help but laugh. Since I believe that God knows where my feet will take me before I even think about stepping… I don’t believe in coincidence. Coincidence is when something happens “by chance” and we’re not paying close enough attention to see the miracle of our story unfolding just as God has always known it would. Why is it that people can believe in coincidence and not in providence? I can either believe that something just happened, or I can believe that God is sovereign and has his hand on my life. I find much more comfort in the latter. As I work in this new job and my brain feels the pressure of cramming in codes and numbers and a whole new set of faces and names and languages, I picture my calendar and remember that my being in this new place is not coincidence or happenstance. God knew I’d be here at this moment in time. God was here before me, he’s here with me now, and he’ll have my back when it’s time for me to move on… and he’ll already be there. I heard once that coincidences are God’s way of staying anonymous.